Also serving communities of Louisville. There are 8 Assisted Living Facilities in the Maryville area, with 7 in Maryville and 1 nearby. The average cost of assisted living in Maryville is $3,438 per month. This is higher than the national median of $3,346. Cheaper nearby regions include Knoxville with an average starting cost of $2,949. To help you with your search, browse the 48 reviews below for assisted living facilities in Maryville. On average, consumers rate assisted living in Maryville 3.8 out of 5 stars. Better rated regions include Knoxville with an average rating of 4.2 out of 5 stars. Caring.com has helped 7 families in Maryville find high-quality senior care. To speak with one of our Family Advisors about assisted living options and costs in Maryville, call (855) 863-8283. Maryville, a city with a population just over 27,000, lies in the foothills of the Great Smoky Mountains and is the county seat of Blount County. Nature-loving seniors will appreciate the mountain scenery and the many parks scattered throughout the region. There are eight assisted living facilities to choose from in the area, including seven within Maryville city limits. In Maryville, as throughout the state of Tennessee, these communities are licensed through the Tennessee Department of Health. The cost of living in Maryville is about 12.7 percent lower than the average throughout the U.S., which makes this city a bargain for budget-conscious seniors. The Cumberland Mountains northwest of Maryville and the Great Smoky Mountains lying southeast of the city modulate the temperatures in the area and shelter Maryville from most severe storms. Warm, humid summers with comfortable summer nights shift easily into cool, dry fall weather, then to wet winters with occasional short-lived snowfall and pleasant spring temperatures. The distinct seasons and mild weather throughout the year encourage active seniors to spend time enjoying the outdoors. Maryville has an array of community resources for seniors, including the Blount County Office on Aging, an organization that advocates for senior residents and runs a volunteer senior transportation program, as well as the Everett Senior Center in central Maryville. The Maryville area is home to world-class medical facilities, including Blount Memorial Hospital, in the event of medical emergencies or illness. Public transportation in Maryville is limited to the East Tennessee Human Resource Agency (ETHRA) public transit system, which provides door-to-door service within Blount County and neighboring counties when reserved three days ahead of time. The service operates during the day on weekdays, making it useful for seniors who need transportation to medical appointments or shopping areas. Maryville is part of the greater Knoxville metro area, which is 22nd on the American Lung Association's list of most polluted cities measured by year-round particle pollution. Air pollution in the Maryville area could pose problems to seniors with chronic respiratory issues. Assisted Living costs in Maryville start around $3,438 per month on average, while the nationwide average cost of assisted living is $4,000 per month, according to the latest figures from Genworth’s Cost of Care Survey. It’s important to note that assisted living rates in Maryville and the surrounding suburbs can vary widely based on factors such as location, the level of care needed, apartment size and the types of amenities offered at each community. 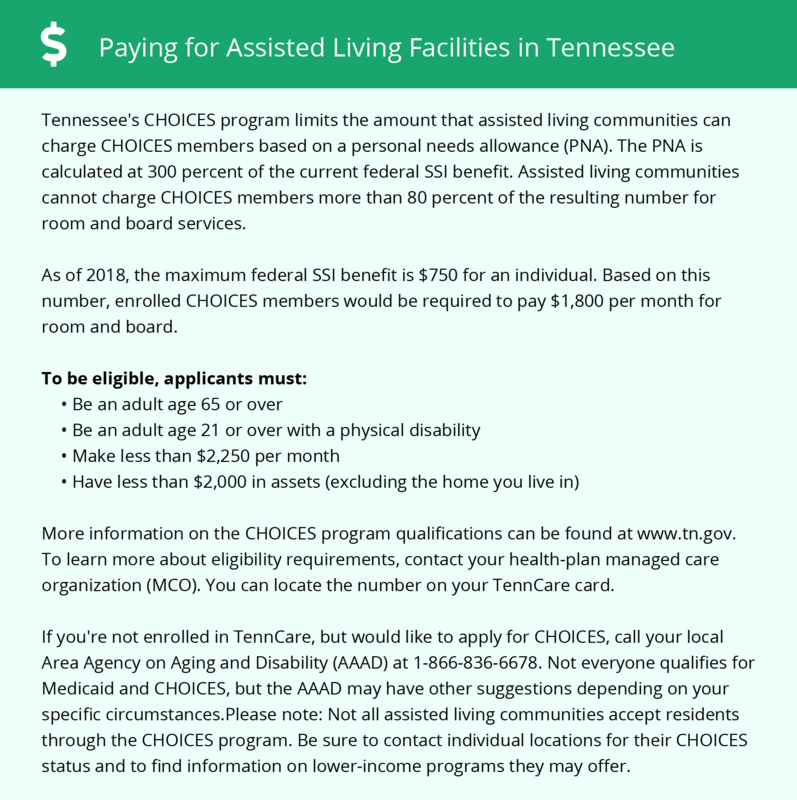 The TennCare CHOICES program, part of the Tennessee Medicaid program, can help qualified seniors pay for the cost of assisted living in Maryville. Seniors must already be on Medicaid to qualify. Maryville and the surrounding area are home to numerous government agencies and non-profit organizations offering help for seniors searching for or currently residing in an assisted living community. These organizations can also provide assistance in a number of other eldercare services such as geriatric care management, elder law advice, estate planning, finding home care and health and wellness programs. To see a list of free assisted living resources in Maryville, please visit our Assisted Living in Tennessee page. Maryville-area assisted living communities must adhere to the comprehensive set of state laws and regulations that all assisted living communities in Tennessee are required to follow. Visit our Assisted Living in Tennessee page for more information about these laws.